Meadowbrook Farm Presents Plants You’ll Love! The Meadowbrook Spring Open House on Saturday, April 28 can provide you with phenomenal plants to make this year’s garden your best yet! Below are some essential additions to your garden that will delight and dazzle you. Lotus Amazon Sunset: This bold and fiery (yet delicate and ornate) plant is perfect for hanging baskets, containers, and window boxes. It is also beautiful hanging over a low wall like in the photo on the right. 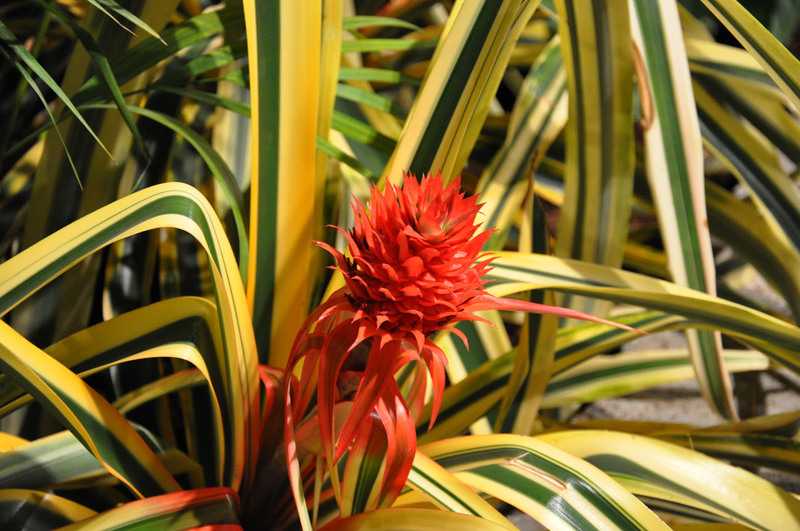 We love this plant because it reminds us of the bold colors and exotic forms found at “Hawaii: Islands of Aloha,” while being perfectly suited for the local climate. Euphoriba Diamond Frost: This ethereal plant produces masses of pure white bracts above finely textured, apple-green foliage. It can add stunning texture and color to your garden, and thrives in partial shade. 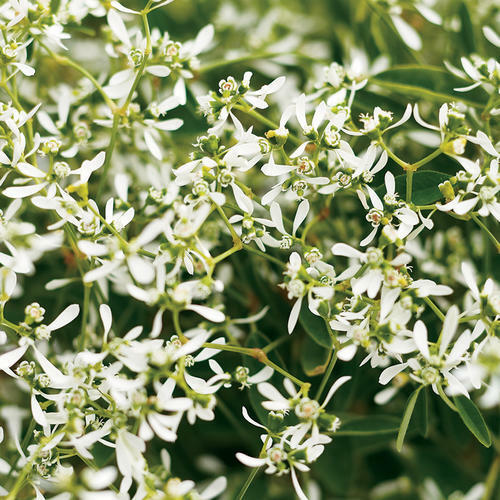 As you can see in the picture, the Euphoriba Diamond Frost has intricate blossoms that add whimsy to any garden. 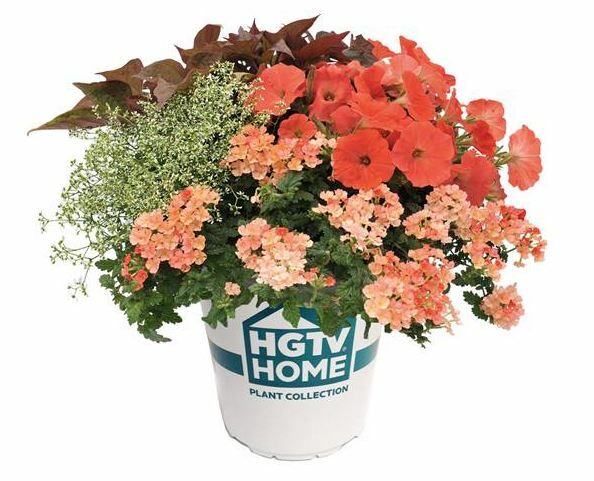 Next up is a very special HGTV mixed container that will make its nationwide debut at the Spring Open House. The planting pictured above is called “orange bliss.” It is part of the Expressions line and is only available at Meadowbrook Farm (while supplies last). Additional plants for you to fawn over include Nemesia, Diascia, Cuphea, Solenia Begonia, Geraniums, and Verbena. Plant lovers, rejoice! And come on out to the Spring Open House this Saturday! Directions, hours, and additional info on tours and kids crafts can be found at www.meadowbrookfarm.org. Your Garden Can Look Like a Flower Show! Did you know that Meadowbrook Farm grows many of the plants used by exhibitors at the Flower Show? 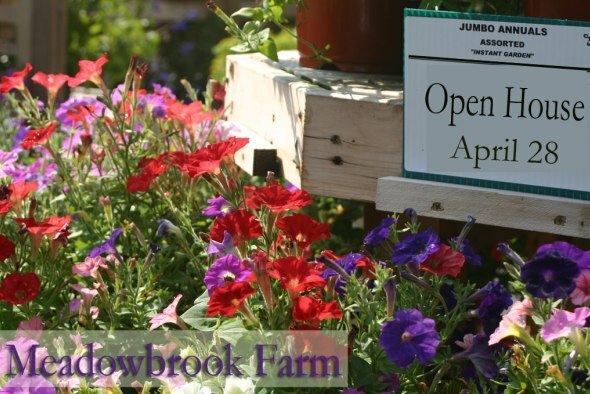 Now you can bring those same high-quality plants to your garden when Meadowbrook Farm celebrates spring with an Open House on Saturday, April 28 from 8 am to 6 pm. Get ready to fill your car with gorgeous hanging baskets, cool combination planters, Americana geraniums, heirloom vegetable and herb starts, and even some funky terrariums. Looking for that perfect Mother’s Day gift? Delight her with a beautiful spring scarf or some colorful jewelry found in the gift shop, which also features pottery, baskets, and garden accents selected to complement your home. For event details and directions, click here, and remember that PHS members always save 10% on plants. Meadowbrook Farm is located at 1633 Washington Lane, Meadowbrook, PA 19046; phone 215-887-5900. By now I sincerely hope you’ve blocked out time to attend the world famous Flower Show. But if you’re too excited to wait for March, you’ll be happy to learn Meadowbrook Farm is hosting three events to get you in the right frame of mind for Hawaii: Islands of Aloha. Since 1982 John Story has been the brains behind the art and science of convincing plants of all kinds to bloom in harmony for the Philadelphia International Flower Show–in conditions and at a time of the year when they would all rather be asleep. John’s talk will be sprinkled throughout with war stories from thirty years of Shows. The presentation will be followed by a wine and cheese reception. Click here to register. Contact Carol Dutill for more information. Tropical plants make great houseplants and blooms and foliage alike are sure to brighten up any room in your home. Shop Meadowbrook Farm on Saturday, February 4 to enjoy 20 percent off amazing orchids, beautiful begonias, unusual cacti and succulents, carnivorous plants and more! PHS Members save 30 percent! Meadowbrook experts will be on hand all day to answer your questions and help you choose the right plants for your home. You can also pick out pots—distressed clay pots, vintage verdigris containers, glazed ceramics—and get help pairing them with pots. Also check out Meadowbrook’s selection of fertilizers for every variety of plant as well as special soil blends for orchids, begonias, ferns, and more. While you’re there, make sure to warm up by sampling some of Christina Maser’s soups like shiitake mushroom, white bean chicken chili and warming chicken barley. Soups, jams, and spreads will be sampled throughout the day, starting at 10 am. How do all those out-of-season plants bloom just in time for the Philadelphia International Flower Show? The magic happens at Meadowbrook Farm. Join John Story and staff as they lead a tour through the greenhouses, highlighting the unusual plants being grown for displays at the 2012 Show, Hawaii: Islands of Aloha. You will see them first at Meadowbrook and learn the fascinating, intricate details that are part of this amazing horticultural balancing act. Light refreshments will be served after the tour. Click here to register. Contact Carol Dutill for more information. Check out the PHS Facebook page for photo albums of the events. (You don’t need a Facebook account to see all the smiling faces!) And if you missed out on the fun, hit the “like” button to stay informed on what’s ahead. 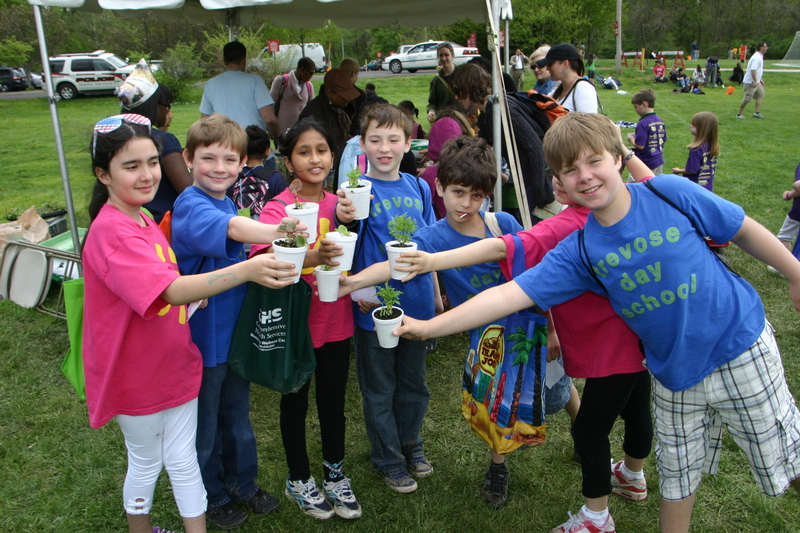 Meadowbrook Open House – Tomorrow! As all of London busily makes final arrangements for the royal wedding, the team at Meadowbrook Farm is preparing for the Spring Open House on Saturday. Featuring designs and gift items inspired by England, this tea-party-with-a-twist will provide endless ideas for your home castle. Beyond shopping, the Meadowbrook Farm Open House is ideal for spending time with the family. Capture cute pictures of the kids (or grandkids!) in the many gardens and help them plant their own herb to take home. And don’t miss short demonstrations to help you achieve garden greatness. Topics include “Compost ‘Tea’ & Tips for a Greener Garden” and “A Modern Twist on Elegant English Design” (see the full schedule here). So come to Meadowbrook Farm in Abington Township this Saturday, April 30 from 8 am to 6 pm. The first 100 PHS Members to swing by the Membership tent will receive a free plant (one per membership, please bring valid Membership card). Directions and additional information can be found at www.meadowbrookfarm.org. It’s going to be smashing! black petunia photo courtesy of Ball Hort. Co.
Didn’t get invited to the royal wedding? We’ve got the next best thing. Come to the Meadowbrook Farm Open House on Saturday, April 30 (8am to 6pm), for a day of shopping, music, food, and more. The estate and gardens have been decked out for a “proper” English tea. Far from old-fashioned, this party features funky found objects and pops of spring color. A display of PHS Gold Medal Plants will highlight the absolute best plants for the region. These displays, courtesy of Nectars Landscape & Design, will inspire you to add flair and fun to your castle. 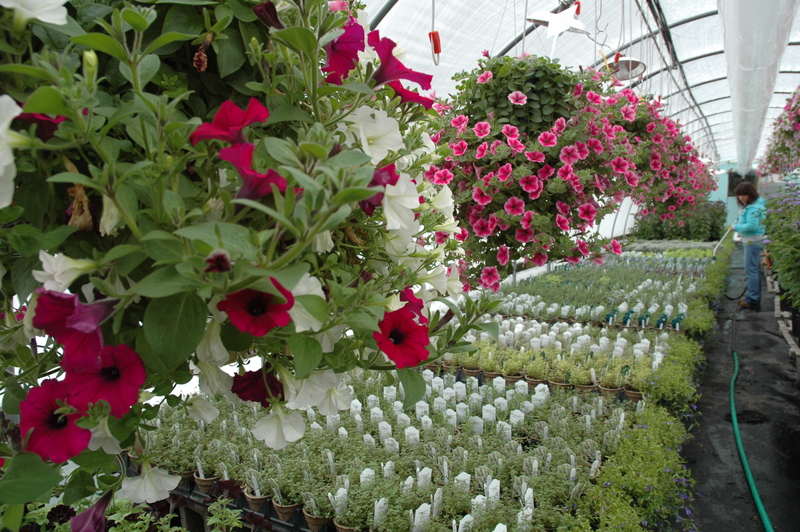 Shop Meadowbrook for herbs, hanging baskets, bulbs, and gifts for Mother’s Day (May 8). On top of all that, the Open House features a kids’ activity, face painting, and fantastic lunches and snacks from Curds ‘n Whey. Find more information at www.meadowbrookfarm.org. This Open House is sure to be smashing! Meadowbrook Farm’s Extended Spring Hours! Did the Flower Show inspire you to achieve gardening greatness? Meadowbrook Farm wants to help! Longer, warmer days means Meadowbrook will be opening earlier and closing later, starting April 17. And it will even be open on Sundays! Come in to shop for quality annuals and perennials, indoor plants, garden accessories, and gifts for the home. Plants makes great gifts for Passover, Easter, and Mother’s Day, and PHS members save 10% on all plant purchases. 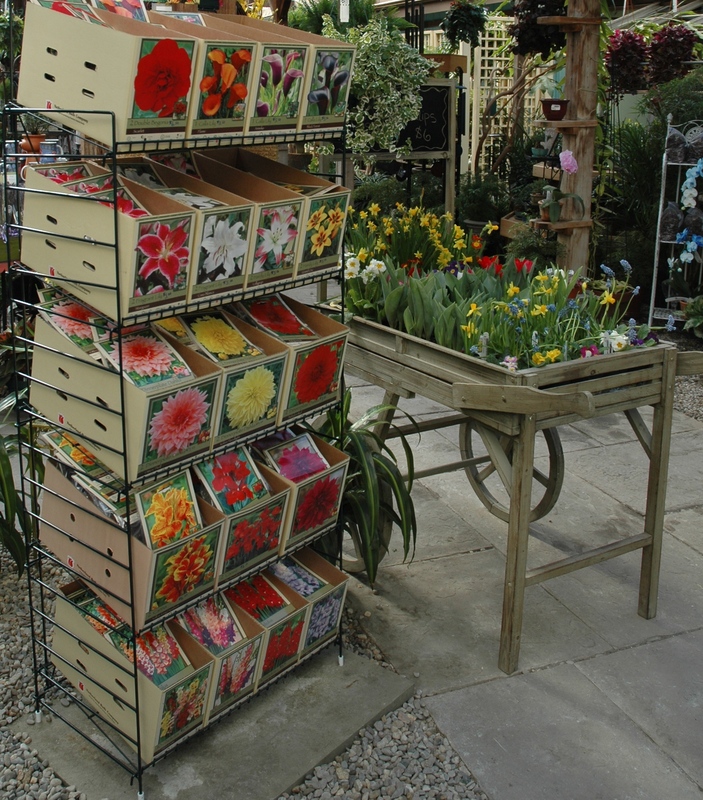 Spring is here, so don’t miss out on Meadowbrook shopping to find beautiful accents for your garden and home. Earlier we highlighted some of the quality plants available at the Meadowbrook Farm Store in the center of the Flower Show floor. One thing we didn’t mention was the bulbs! Sure, they don’t look like much when you buy them, but these bulbs will add a burst of color to any landscape. Plus, they have really cool names. See the quiz below! 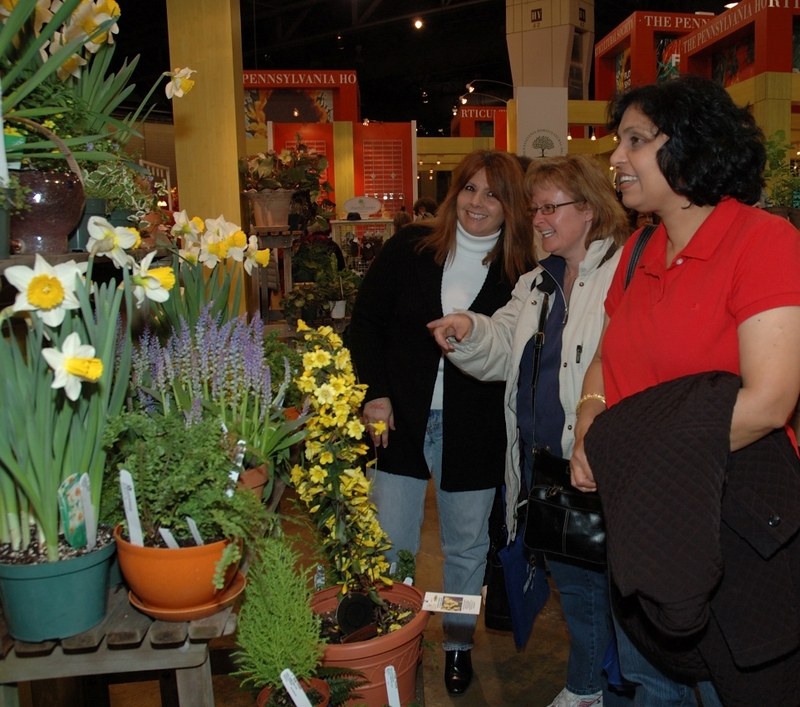 The Flower Show is the perfect place to plan your spring and summer garden, and no Flower Show trip is complete without a visit to the Meadowbrook Farm Store. Look for the smiley people in berry-colored aprons; they’ll be happy to guide you to the perfect plant for your growing conditions, color palette, or personal style. If you’ve been to the Flower Show in recent years, you likely remember the Meadowbrook Farm Store located in the center of the Show floor. Good news, the store is returning, and this year there’s even more of the stuff you love. All week the Meadowbrook team has been setting up the satellite sales location, lining the shelves with Meadowbrook merchandise. This includes—but by no means is limited to—painted watering cans, mossy ceramic planters, French vases with fleur di lis, baskets, candles, and soaps. As for the plants, Meadowbrook will offer beautiful specimens for beginners and hard-core horticulturists alike. The always popular herbs will be back in a big way. 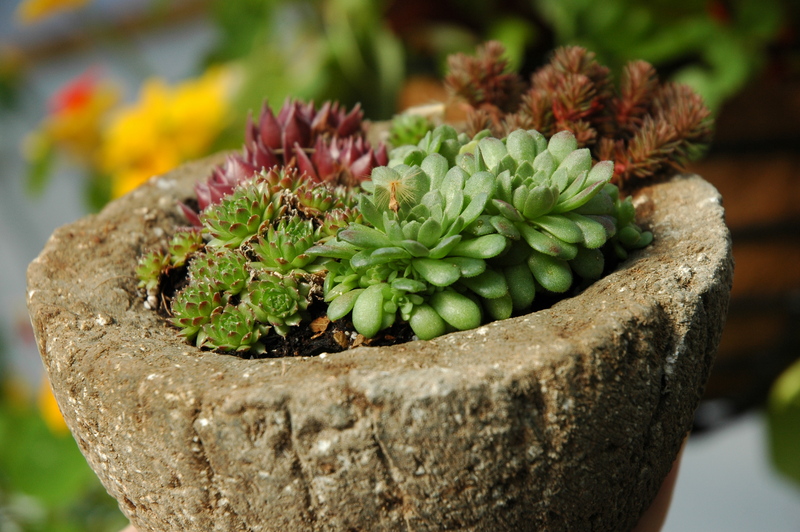 Also of note are terrariums, potted hens-and-chicks (seen here), ferns, and topiary. If fragrance is your focus, check out the violets and jasmine. And if you were intrigued by the Irish primrose mentioned here last week, take note: Meadowbrook is the only place on the Show floor to sell them. Thanks, Burpee Seed Company, for making that happen! See you at the Meadowbrook Farm Store! Looking for the perfect pre-Flower Show pick-me-up? We got that. On the evening of February 22, join PHS for a French wine tasting and behind-the-scenes tour of the Meadowbrook greenhouses. Meadowbrook Farm grows a major percentage of the plants used in Flower Show exhibits, so this is a sneak preview is something special. As France is home to some of the greatest wines on the planet—and this year’s Show theme is “Springtime in Paris”—PHS has invited sommeliers from the Wine School of Philadelphia to share their expertise while guests sip samples. Additionally, John and Jessica Story of Meadowbrook Farm will lead tours through the greenhouses and share their incredible knowledge of the plants about to take center stage at the Show. You’ll also be able to shop the Meadowbrook gift shop and greenhouse, filled with traditional and exotic houseplants, glassware, jewelry, vases, and statuary. You can also be among the first to see special 2011 Flower Show merchandise. As always, PHS members enjoy a 10% discount on Meadowbrook plant purchases (non-sale items). This Tuesday, February 22 event runs from 6 pm – 8 pm and is open to the public. Register here.